The announced objective of the Trump administration's trade policy is protection of American jobs. But it isn't quite working out that way at Ford. The automaker has taken a huge hit in the form of tariffs on imported steel and aluminum, making production more costly at a time when it can't afford to pass those costs along to consumers. New car costs are already near a record high. In response, Ford plans to reorganize its workforce, meaning thousands of jobs are being targeted for elimination. In an interview with NBC News, Ford's chief financial officer Bob Shanks said the company is reorganizing its business to reduce overlap and become leaner. To do that, the company is eliminating an undetermined number of people in its global workforce, many of them management employees based in the U.S. An estimate by investment bank Morgan Stanley puts the layoffs at about 12 percent of Ford's global workforce. Ford's September sales were sharply lower, but so were results for most other automakers. September 2017 saw a surge in sales because so many vehicles had to be replaced after Hurricane Harvey. This September’s sales suffered in comparison. Ford's total vehicle sales last month were down nearly 12 percent year-over-year. Ford said its overall average transaction price increased $1,500 for September, expanding more than twice the rate of the overall industry average. 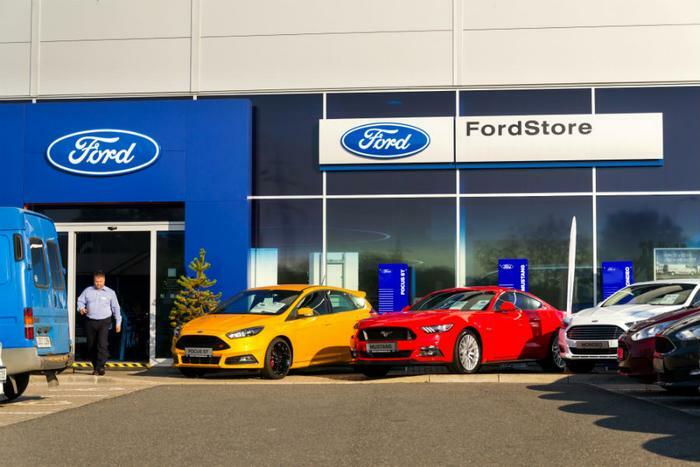 The number of vehicles Ford sells is not the problem. The cost of producing them is. Ford CEO Jim Hackett says the trade war with America's trading partners and resulting tariffs are hurting the company's bottom line. Trimming the workforce is not the only step Ford is taking to stave off the red ink. It recently announced that it will end production of cars, except for the iconic Mustang. In the future, it will focus on turning out trucks and SUVs. In recent weeks Ford suspended plans to import the Ford Focus Active, a crossover made in China, saying the tariffs placed on imports from China made the car too expensive.